Originally posted: November 28, 2018 . Last modified: November 28, 2018 . 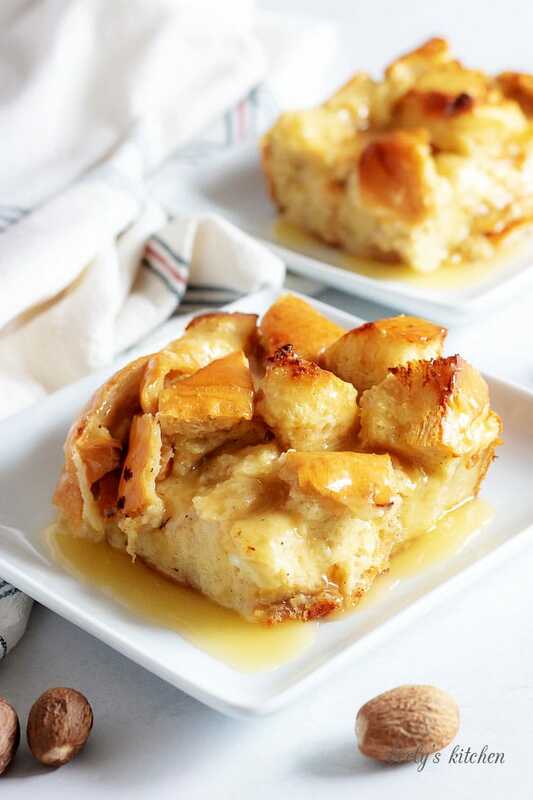 Treat your family to our festive, eggnog bread pudding with rum sauce. We took a traditional bread pudding, added eggnog, and topped it with a sweet sauce. As you may have guessed from the title of this dessert, Kim and I wanted to make something special for the this post. We already have a few holiday favorites out there, like our cranberry bread, berry cobbler, or our special hot chocolate. However, for today, we’re sharing something that, I hope, all the grown-ups in your house will love. It’s an eggnog infused bread pudding with rum sauce. The recipe description says it all, a traditional bread pudding with eggnog and rum added to the batter. As far as the rum sauce goes, it’s pretty basic. A little melted butter, some sugar, and of course, more dark rum. The pudding takes a little bit to prepare, but I feel it’s worth the effort. Since this dish is time-consuming, I won’t bore you with a long story. As always, check out our tips below for helpful hints. Let’s get started! First, start by gathering all your ingredients and spraying a 9×13-in. casserole dish with non-stick cooking spray. Also, don’t forget to preheat your oven to 350 degrees F.
Next, cut the French loaf into 1-in. cubes. Remember, you should be using, “day-old,” bread. Now, in a large mixing bowl, whisk together the eggs, sugar, eggnog, rum, vanilla extract, nutmeg, and all-spice. Really give everything a good mix, like your making scrambled eggs. Then, pour the mixture over the prepped bread and use a spoon to give the ingredients a good toss. 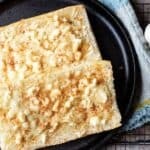 You want to make sure the bread is properly coated with eggs. After that, cover the bread pudding with aluminum foil and let it chill in your fridge for at least 30-minutes. Honestly, I’m not sure why this is needed. But, every bread pudding with rum sauce I’ve ever made requires this step. So, I wouldn’t skip it if I were you. Then, remove the dish from your fridge and place it in the oven, covered, to bake for 30-minutes. Last, remove the foil and let it continue to cook for an additional 10-15 minutes so the pudding can set-up. Take it out of the oven and get started making the sauce. First, in a medium saucepan over low heat, combine the heavy cream, sugar, and butter. Make sure to keep stirring the sauce while it cooks. Next, while stirring, let the butter melt and the sugar dissolve. Last, slowly add the dark rum to the saucepan and mix it into the sauce. That’s it, the sauce is done, now drizzle it over each piece of bread pudding or over the entire dish. 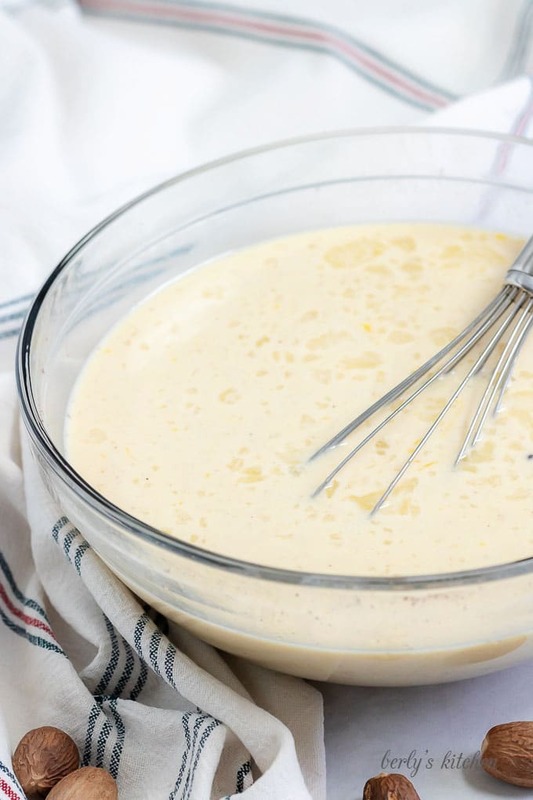 This dessert can be made, “virgin,” simply omit the rum from the batter and the sauce. With that being said, it will change the flavor of the pudding. If you don’t have, “day-old,” bread, just leave the French loaf out on your counter overnight and prepare the holiday dessert tomorrow. You can reduce the sugar in this recipe by substituting Stevia or another sweetener in place of the granulated sugar. Also, for a more natural approach, try using maple syrup or honey in place of the sugar. 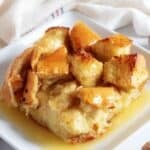 If you like this bread pudding dessert recipe, please leave us a comment and rate the recipe card. You can also find us on Facebook, Pinterest, Twitter and Instagram searching for Berly’s Kitchen! Spray 9x13in casserole dish with non-stick cooking spray and preheat oven to 350 degrees F.
Cut the loaf of bread into 1-in pieces and place into the dish. 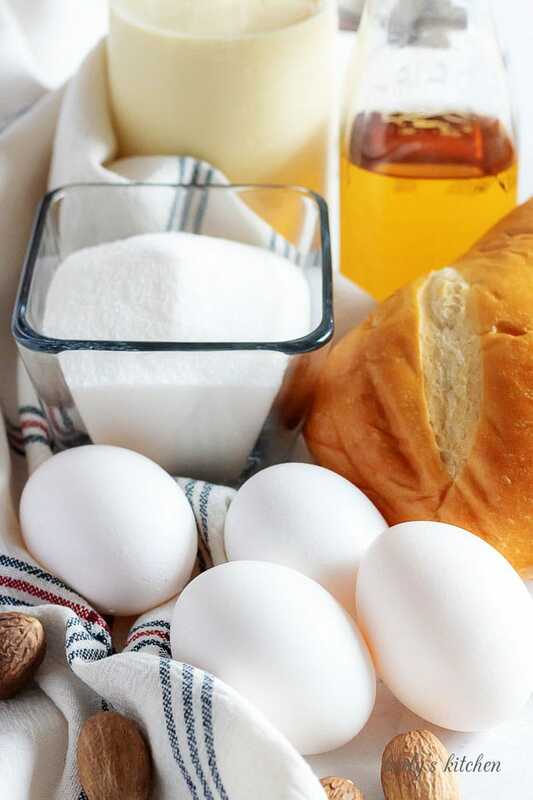 In a large bowl, mix together the eggs, eggnog, rum, sugar, vanilla, nutmeg, and all-spice. Pour the mixture over the bread and use a spoon to stir the bread so that all the pieces are coated with the egg mixture. Cover the dish with foil and let it chill in the fridge for at least 30-minutes or until the liquid has been absorbed by the bread. Let the bread pudding bake for 35-minutes, then remove the foil. Bake the pudding for an additional 10-15 minutes or until it has set. In a medium saucepan, combine the heavy cream, sugar, and butter. Stir the sauce constantly over low heat until the butter melts and the sugar dissolves. Carefully, add the rum and stir everything to combine it. 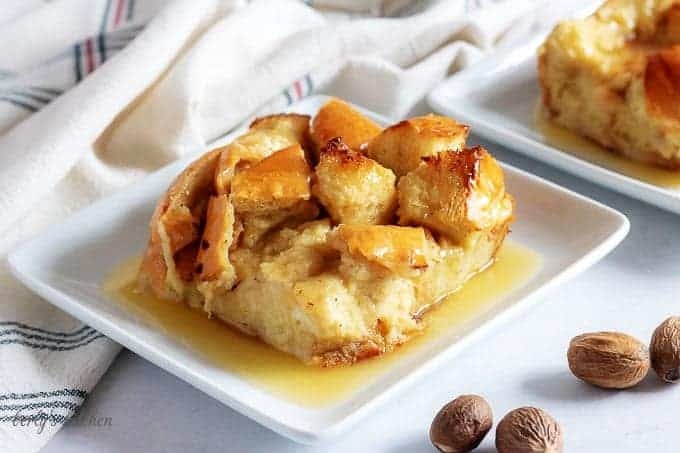 Remove the pan from the heat and pour it over each individual slice of bread pudding. The calories listed are an approximation based on the ingredients and a serving size of 1/12th the entire dish (1 piece when the dish has been cut into 12 equal servings). 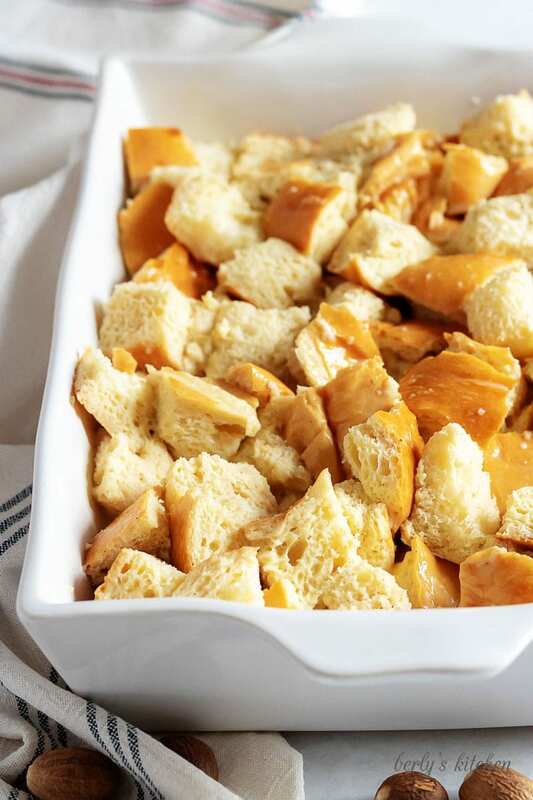 The bread pudding can be stored in your fridge for up to 3-days in a sealed container. 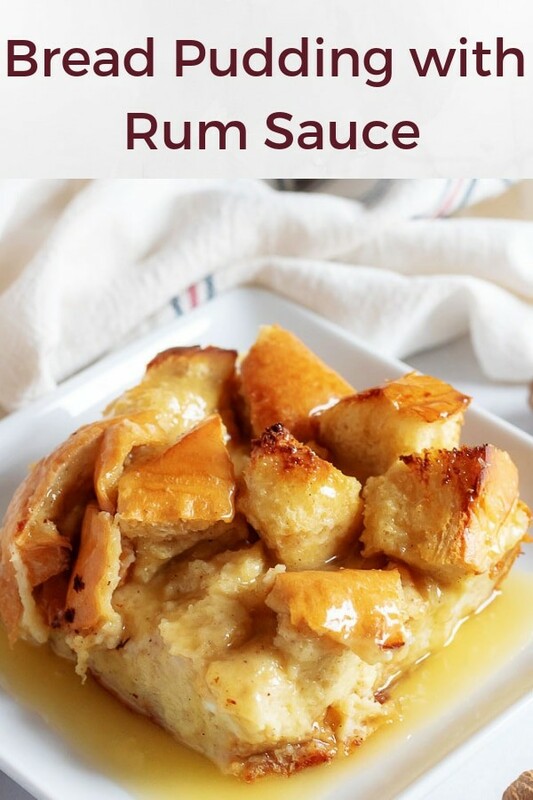 in the recipe for Eggnog Bread Pudding with Dark Rum Sauce do you have to use eggnog or can you substitute milk or heavy cream instead.